Here are the last of the documents from the Lehman Examiner's Report that I found interesting (or at least the last ones that I'm planning to post). The first is a list of the top 25 Lehman counterparties by exposure. (CCE is current credit exposure; MPE is maximum potential exposure.) The two counterparties with the highest exposure to Lehman? The Italian government, and Berkshire Hathaway (BH Finance LLC is a Berkshire sub). The next two documents are the two backup plans that the Fed had for dealing with a Lehman failure. The first plan is called "Managing a Loss of Confidence in a Major Tri-Party Repo Borrower," and is dated July 11, 2008. While it initially talks about primary dealers in general, it goes on to calculate the financial impact of the plan in the event of a Lehman failure, and was very clearly developed for Lehman. The second is a good bank/bad bank plan, and involves the Fed setting up a Bear Stearns-style SPV. Had the FSA allowed Barclays to buy Lehman, and had the Wall Street consortium been unwilling to fund the entire "bad bank" to facilitate the Barclays sale, it's quite likely that the Fed would have implemented this plan. But, of course, when the time came, BofA bailed on Lehman for Merrill, and the FSA refused to let Barclays purchase Lehman. Next is an email exchange between Fed Vice Chairman Don Kohn and Ben Bernanke on Lehman from June 2008. The whole thing is interesting, but the most interesting part is when Kohn says to Bernanke: "One of the hedge fund types on Cape Cod told me that his colleagues think Lehman can't survive—the question is when and how they go out of business not whether. He claimed this was a Widely shared view on the Street." Last but not least, here's an internal JPMorgan presentation detailing JPM's exposure to Lehman as of Sept. 5, 2008. This is just interesting from a data standpoint, especially because JPM was Lehman's main clearing bank. It also partly explains why JPM decided to make their infamous $5bn collateral call on the Thursday before Lehman failed — even before JPM marked down the value of Lehman's clearing bank collateral, they had a $3bn exposure to Lehman. As I noted in my post on Lehman's liquidity pool, the financial crisis of 2008 — and the Lehman episode in particular — highlighted the pressing need for formal liquidity requirements. Fortunately, the Basel Committee has made a new liquidity regime a focus of Basel III. The new liquidity regime can be found in the December 2009 consultative document as amended by last month's Annex. Net cash outflows, in turn, is calculated by applying run-off rates to different sources of funding (e.g., repos, unsecured wholesale, etc.). So the action here is in (1) the definition of "high quality liquid assets," and, more importantly, (2) the run-off rates used to calculate "net cash outflows." In the initial consultative document, the Basel Committee defined "high-quality liquid assets" extremely conservatively, such that the only eligible assets were essentially cash, central bank reserves, and sovereign debt. Crucially, Agencies and Agency MBS were excluded, due to the requirement in Paragraph 34(c)(i) that the assets have a 0% risk-weight under Basel II (Fannie and Freddie obligations have a 20% risk-weight). In last month's Annex, the Commmittee fixed this, adding a "Level 2" category of liquid assets that includes GSE obligations (but with a 15% haircut). Level 2 assets, which also includes non-financial corporate and covered bonds rated AA- or above, can't comprise more than 40% of a bank's total stock of high-quality liquid assets. I have to think this was a deliberate strategy — the Committee was always going to allow GSE obligations in the liquidity pool, but they wanted to give the banks something to howl about, and focus all their energy on. So in sum, banks' liquidity pools have to be at least 60% Level 1 assets (cash, central bank reserves, and sovereigns) and no more than 40% Level 2 assets (GSE obligations, and non-financial corporate or covered bonds rated AA- or above). That's appropriately conservative, in my view — all of these assets would have been monetizable in 24 hours or less during the financial crisis. What do I think of these run-off rates? I think they're mostly appropriate and sufficiently conservative. I was pleasantly surprised by how comprehensive the LCR proposal was — that is, the Committee seems to have anticipated all the meaningful sources of funding outflows. For example, I was impressed that the LCR proposal addressed changes in the value of collateral posted on derivatives trades. I'm also glad the Committee held the run-off rate for unsecured wholesale funding from financial institutions at 100%. Given what we saw during the financial crisis, that's entirely warranted. I was disappointed that the Basel Committee gave so much back on repos of non-liquidity pool eligible assets. Initially, the run-off rate was 100%. That was probably too high, but not outrageously so. The banks cried bloody murder, of course. Their main argument was that they were able to reliably repo out equities during the financial crisis (albeit with substantial haircuts), due to the deep market, and thus reliable marks, for most equities. That's a legitimate point; I just don't think it merits reducing the run-off rate from 100% to 25%. I thought the Committee would, at most, reduce the rate to 50%, and I think 75% would be more appropriate. The problem with this is that it's a really, umm, stupid argument. Yes, the run-off rates were probably lower during the financial crisis, but there were also massive government bailouts during the financial crisis. After Lehman failed, the market only made it 2 days without a government bailout — the Fed rescued AIG on Tuesday night, and Schumer leaked that the government was planning a system-wide bailout on Thursday. Regulators were kinda sorta hoping that we could do the next financial crisis without massive government bailouts. Okay, that's enough on Basel III for right now. Add: It just occurred to me that I didn't address the "expected cash inflows" aspect of the LCR. (Cash inflows are subtracted from cash outflows to arrive at "net cash outflows" for the 30-day window.) It's not that big of a deal though, because the rule for expected cash inflows is basically this: You get no cash inflows for 30 days, and you will like it. Since people seem to like the bits of information from the Lehman Examiner's Report, I'll keep going. I've got plenty more where that came from! This is probably my favorite document from the Examiner's Report — it's a compilation of the daily reports from the NY Fed's on-site examiners at Lehman. It covers August 15, 2008 through September 11, 2008. It's as close as it gets to an official blow-by-blow account of Lehman's downfall, and it contains all the relevant information — daily updates on Lehman's repo funding, commercial paper, liquidity pool, and CDS spreads, as well as market color from Lehman's treasury and from other primary dealers. This is what Tim Geithner and (I have to imagine) Hank Paulson were seeing every day. To read it chronologically, which you really should, you have to start from the bottom. I OCR'd it and ran a bookmark program (because I'm that OCD), so you should be able to navigate to specific days. I have a similar compilation that covers July 1 – July 23, which I'll post as well if people want. Some more of my favorite documents from the Lehman Examiner's Report. This time, analysts who were wrong about Lehman — some spectacularly so. It's hard to top the Buckingham Research Group note, but Morgan Stanley, Citi, and (of course) Moody's give them a run for their money. During my long slog through the entire Lehman Examiner's Report, I came across lots of interesting-but-not-mind-blowingly-important bits of information, and I'm going to try to highlight my favorite ones. These two both come from the handwritten notes of Thomas Fontana, head of risk management in Citi's Global Financial Institutions group. The notes in question were taken during meetings at the New York Fed on the Sunday before Lehman failed (Sept. 14, 2008). First, we learn that Vikram Pandit, CEO of one of the largest bank holding companies in the world (Citigroup), apparently didn't know what Section 23A was. For non-finance types, Section 23A is the law that governs transactions between commercial banks and their non-bank affiliates. If you've ever worked at a big bank, you know what 23A is — unless, apparently, you're the CEO. This definitely isn't a lawyers-only thing either — Fontana is a risk manager, and he was so surprised that he felt compelled to write, "VP [Vikram Pandit] doesn't know what 23A is?" Oh, Vikram. 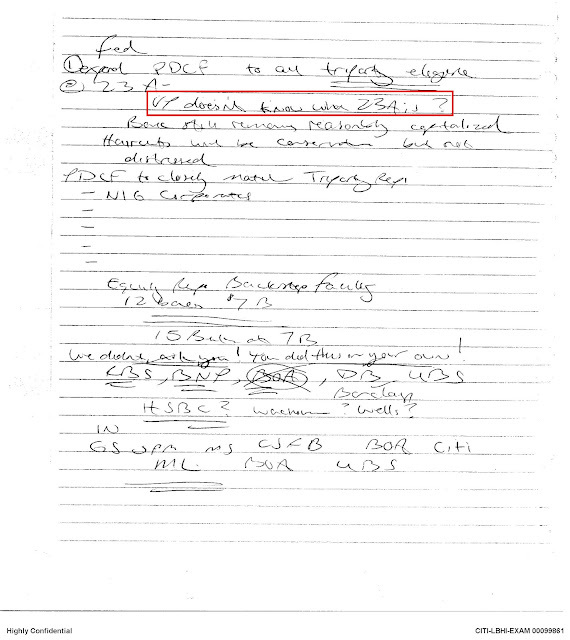 Next, Fontana's notes appear to indicate that Hank Paulson foresaw that Lehman's bankruptcy filing would cause problems in the money markets, and was concerned about money market funds breaking the buck — which, of course, actually happened, and caused a devastating run on the U.S. money markets. The conventional wisdom has been that policymakers were completely blindsided by the run on money market funds (I know I didn't expect it either). 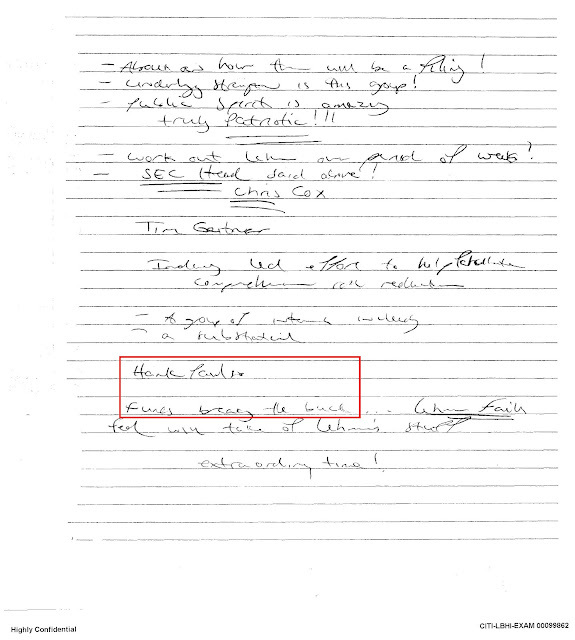 But in Fontana's notes, taken during a meeting with Geithner and Paulson just before Lehman filed for bankruptcy, right under "Hank Paulson" it says "Funds breaking the buck . . . ." (I'm terrible at deciphering other people's handwriting, so I don't know what it says right after that.) In any event, I thought it was interesting that contrary to popular belief, Paulson actually was concerned about money market funds breaking the buck as a result of Lehman's bankruptcy filing — that it wasn't some out-of-nowhere problem that no one had anticipated. I've suspected this for a few months now, but Dallas Fed president Richard Fisher's recent speech — which Paul Krugman takes apart here — may provide some actual evidence to back up my suspicions. One big question has been why the Fed doesn't seem willing to do more to stimulate the economy, even in the face of persistently high unemployment and looming deflation. Krugman has suggested that the Fed is afraid to try something unorthodox because no one knows how well it would work, and failing would be very embarrassing for the Fed. I think that's part of the story. But I also suspect that the Fed is reluctant to do more because the last time they went out on a limb and took extraordinary/unorthodox actions — bailing out AIG, establishing currency swap lines, supporting the money market funds — they were eventually savaged by politicians and the press for those actions. (And, mind you, the multiple investigations into the AIG bailout have turned up nothing legitimately untoward.) Even though the Fed was right to do those things, and they undoubtedly helped stave off a complete financial meltdown, grandstanding politicians and commentators badly misrepresented the Fed's actions in a (partially successful) effort to "rein in" the Fed's authority and autonomy. Reining in the Fed's ability to undertake extraordinary actions during a crisis became an explicit goal of both Republicans and Progressives during the financial reform debate. If this is the reaction the Fed can expect when its extraordinary/unorthodox actions work, who knows what would happen if the Fed tried something unorthodox and failed. And I think this scares the Fed. They don't want to establish any unorthodox programs, for fear that politicians eager to ride a wave of populist sentiment will make another run at the Fed's authority and independence (or even the Fed's existence). [W]e at the Fed must continue to comport ourselves in a manner that exorcises any lingering worries about our willingness to brook any political interference with our commitment to fostering price stability and maximum sustainable employment. We delivered on our duty to restore liquidity to the commercial paper, asset-backed securities, interbank lending and other markets. We then closed out all of our extraordinary liquidity facilities, doing so without costing the taxpayer a dime (imagine that: a government agency that closes programs after they have outlived their usefulness!). We have worked hard to earn the respect of the marketplace and of the nation, and we dare not risk it at a time when there is so much uncertainty elsewhere. Translation: our earlier extraordinary actions, while successful, led to a good deal of threatened political interference, and we "dare not risk" raising the ire of populists in Congress again. Of course, I don't think this justifies the Fed's inaction — what's the point of having the independence they're so jealously guarding if they're not going to actually use it? Politicians are always going to say idiotic things, and populists are always going to claim that the Fed is in bed with the big banks. But if the mere threat of "political interference" is enough to circumscribe Fed policy, then is the Fed really "independent" in the first place?